During the course of your procedure, your abutment crowns will be attached to the healthy teeth on each side of your missing tooth. 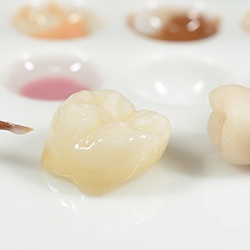 To ensure the proper fit of these crowns, Dr. Boehmer will gently file away some of the natural tooth structure. Just enough is removed from the sides and top to allow the crown to fit evenly between adjacent teeth and against opposing teeth. Your bite should feel completely natural once the permanent crown and bridge are placed! Why Choose Us for Dental Crowns? After the abutment teeth are prepared, we’ll take an impression and place a temporary prosthetic to protect the teeth and fill in the gap. This impression is also what our cosmetic dental lab uses to fabricate your permanent restoration. When this arrives in our office after a couple of weeks, you’ll come back to have Dr. Boehmer cement your dental crown and bridge into place. Once your procedure is complete, your crown and bridge will improve chewing and speaking ability. It will also keep surrounding teeth from drifting out of alignment.